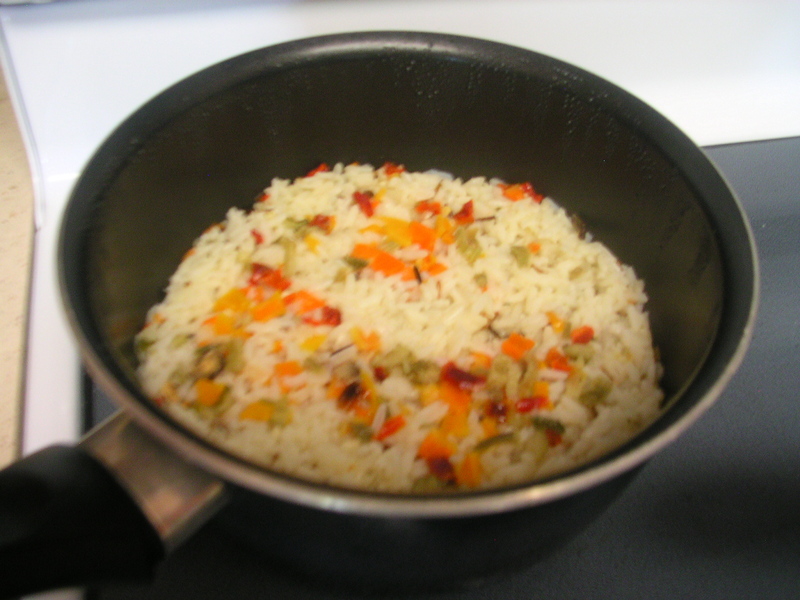 Today, I am going to skip right ahead to dinner as breakfast and lunch meals were not exciting and the day was pretty ordinary. For dinner we went to Keoki’s Tropical Paradise at Poipu Village Shopping Mall. Keoki’s interior is true to its name. It is truly a Tropical Paradise and as in most Hawaiian Restaurants, the walls are open to the surrounding outdoor area, which included Palm Trees and a Lagoon. We were seated nearest to the outdoor area which made the ambience very nice for dinner. In addition, on weekend evenings there is entertainment, Hawaiian Style; we enjoyed the music while we ate. Since we are both light eaters we opted for the Sea & Land Pupu Platters. 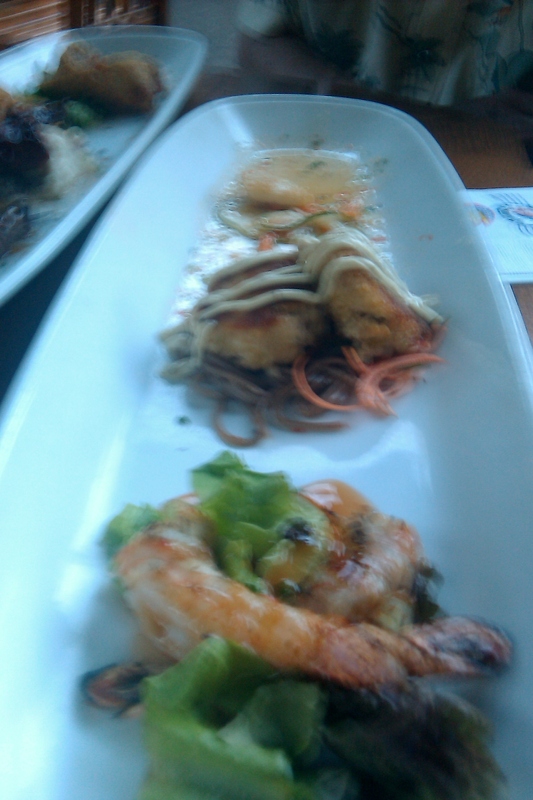 The Sea Platter consisted of Scallops, Shrimp and Crab Cakes and the Land Platter contained Beef Teriyaki Skewers, Egg Rolls, Pork Ribs on Mashed Potatoes with Skinny Onion Rings. 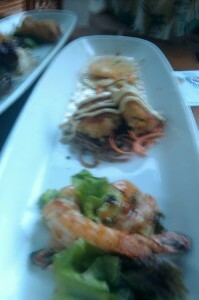 The sauces and marinades were excellent and we entirely enjoyed our choices. Our beverages were Lite Beer for Ev and a Tropical Fruit Cocktail for myself. For dessert we just had to try their famous Hula Pie. 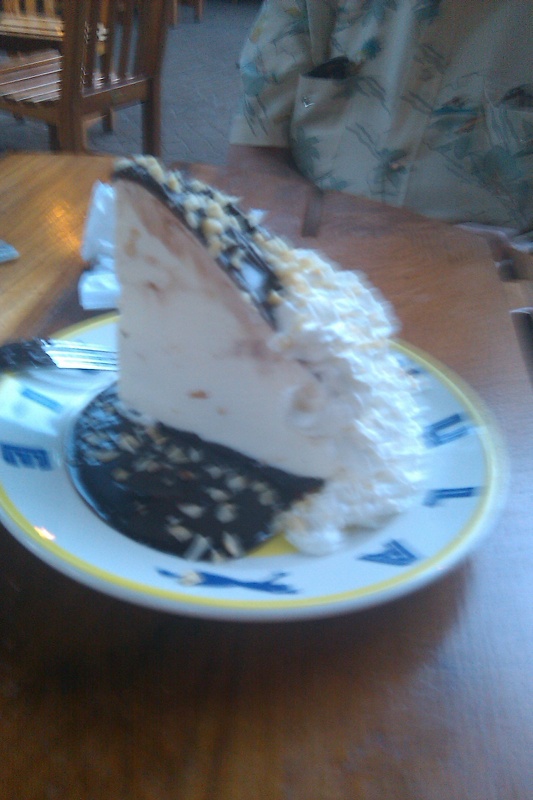 The Hula Pie is a large portion and was enough for the two of us. It was built on a chocolate cookies crust and contained Vanilla Ice Cream shot through with Coffee and was topped with Hot Fudge Sauce, Macadamia Nuts and Whipped Cream. The Hula Pie was a thoroughly satisfying ending to a delicious meal. Thursday was Day Five and it was another early rising day. Again we had breakfast on the go and that consisted of hard-cooked eggs, banana bread and apple bananas. We drove to Koke’e, a natural area located in the upland area of northwestern Kauai, along with Waimea Canyon and Nä Pali Coast State Parks. Our purpose was to view the native birds that inhabit this area. This time we did the easy trails and did get to see quite a few different birds. When we were here in 1996, we actually did the trail in the Alaka’i Swamp. By the time we finished our clothes were covered in Kauai’s red dirt mud and actually had to hose off in the park before we got into our car. It was quite an experience though and am glad we got to do it. The birds that we say this time were: Hawaiian Amakihi, which is a greenish bird with a long curved beak, the Kauai Elepaio, which is a small bird with a long tail. Its head is a reddish brown and it has a small beak designed for foraging for insects. We also saw the Akeke’e, which is a greenish-yellow bird with a black mask around the eye (especially prominent in the male) and a bluish bill. We saw an Anianianu; a honey-creeper with distinct yellow coloring. This bird unfortunately has been prey to malaria brought in by mosquitoes and its numbers are dwindling. The birds can now only be seen in the higher elevations where there are fewer instances of mosquitoes. The last native bird we saw this day was the Hawaiian Iiwi, whose bright red feathers, pink curved bill, and black wings and tail distinguish it from the rest of Hawaii’s forest birds. Other than native birds there were a few introduced species such as Erkel’s Francolin, Jungle Fowl and the Red Crested Cardinal. We also had many Red Crested Cardinals visiting us at our condo. The Jungle Fowl are chickens who roam freely around the island. 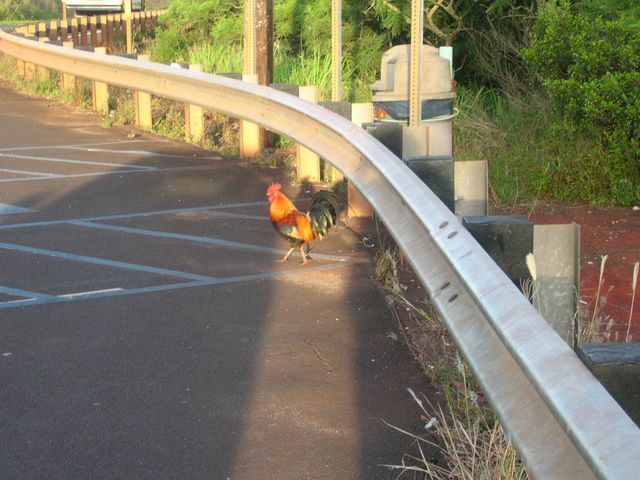 The Jungle Fowl have become so symbolic of Kauai that you can even purchase a red dirt t-shirt with a picture of a jungle fowl on it. This has been enough about birds now, when I’m really supposed to be talking about food. But the birds did lead us to our lunch today and that was at the Shrimp Station in Waimea. We did get there a little early and had to wait for them to open up. The Shrimp Station is more of a stand than a restaurant and all seating is outdoors. Since their kitchen is open to view, we just sat and watched them set up for the day. This is mainly a lunch and early dinner place as the hours are from 11 AM – 5 PM daily. Ev had a craving for Coconut Fried Shrimp and that is what he had along with fries. My cravings went towards the sweet chili garlic shrimp and that was served with white rice of potatoes. 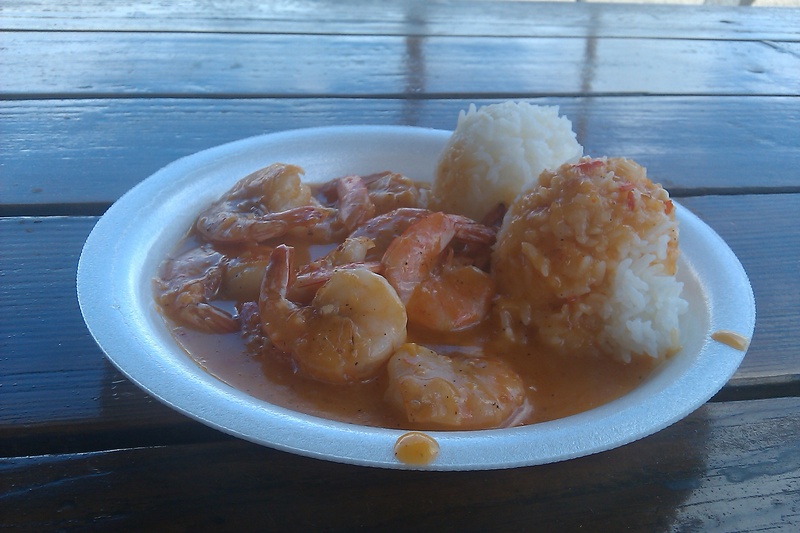 The portion of the sweet chili garlic shrimp was more than ample and even though it was sweet chili there was still a kick to it that the rice helped to buffer. A salad would have been good with this dish as well as some bread. Fortunately we did have cold drinks. 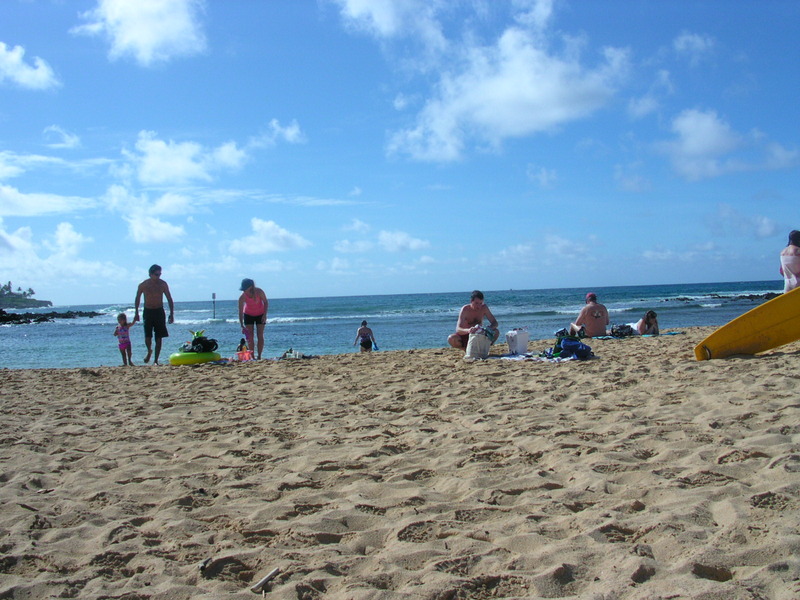 Again, the afternoon was spent on the beach and just relaxing and enjoying the tropical weather. For dinner, I made hamburgers which I ended up calling Tropic Burgers and will probably feature in one of my classes. I had purchased the ingredients the day before and that included ground sirloin, buns, and we had lettuce and tomatoes from the farmers market along with cheese from Big Save. The items I did forget to purchase were mustard, mayo and ketchup so I became innovative and used our Papaya Seed Dressing as our only condiment. They turned out very good. Here is how I made the burgers; sautéed sliced red onions in butter until they were soft and just starting to caramelize. Toasted the buns in the toaster and then cooked the burgers with salt and pepper and some garlic powder. Put cheese on them after they were turned and started to cook on the second side. The dressing went on the buns and the burger on one side and the onions on top of the meat, and then the tomato and lettuce. This really turned out to be an excellent burger. Along with the burgers we opened the bottle of wine that came with the condo. All in all, it was a very good dinner. After dinner, we drove around the corner to the beach and checked out Brennecke’s Beach Broiler for a future meal. The downstairs portion of Brennecke’s makes fresh sandwiches for breakfast and lunch and even dinner, if you are so inclined, and they also sell chips, sodas and other various sundry items. Later on we went back to the condo and sat on the balcony and enjoyed the sunset. 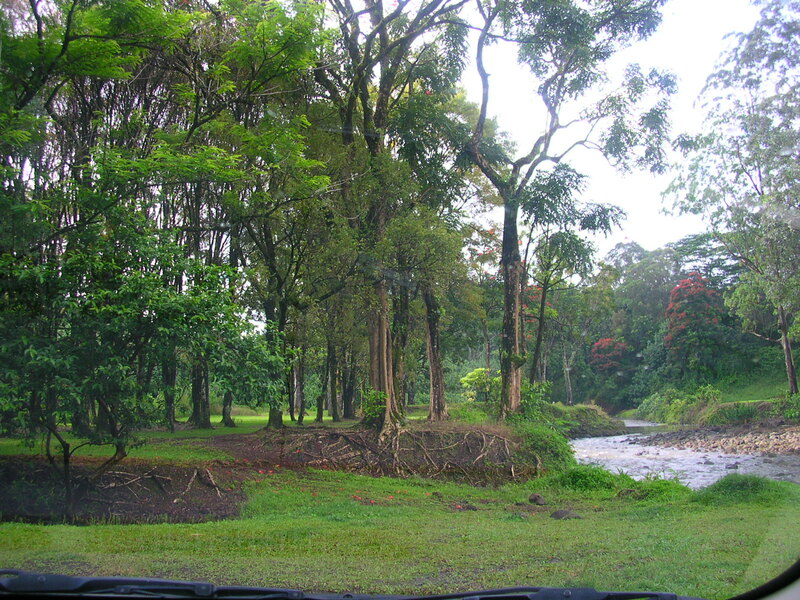 On Tuesday we roused ourselves out of bed around 5:30 AM so that we could drive to Hanapepe to look for the Rose-ringed Parakeets. The flock of Parakeets that exist here are the progeny of pet birds that were released many years ago. While they are very pretty to look at, they do present themselves as pests to the agricultural world. 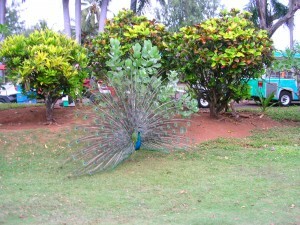 However, since we are birders we love to seek out the colorful tropical birds. The best time to find these birds is early in the morning when they leave their roost for their feeding grounds or at dusk when they return to their roost. We left the condo at around 6 AM and brought breakfast with us. Breakfast consisted of Banana Bread, Apple Bananas and cold drinks. The Apple Banana is a small banana no longer than 4 inches. The flesh of this banana is somewhat firm even when ripe and as they are named, they do taste somewhat like apples. They seem to be the banana of choice among the Kauai growers. 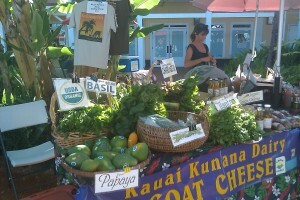 Ours were purchased at the Koloa Farmers Market on Monday, but all the markets carry them as well. 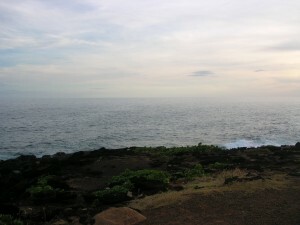 As you drive to Hanapepe from Poipu there is a scenic overview close to Hanapepe. This is where we stopped to try and get a look at the parakeets. After about 30 minutes of patient watching, we did manage to catch a glimpse of several of these birds that flew by. Along with the parakeets, there were many numbers of Cattle Egret, another introduced bird. The Cattle Egret is similar in size to the mainland Snowy Egret, but has a gold bill and gold feathers on the back of its neck. The Cattle Egret also flourishes in the state of Florida, another rather tropical area. These birds are called Cattle Egret because they often are seen around cattle where flies tend to congregate. The birds feed on the insects and flies that are attracted by the cattle. After our viewing at the scenic overview, we then drove into Hanapepe to look for more birds in the river and the rice fields. 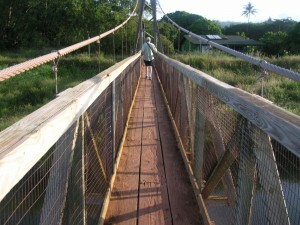 Also in Hanapepe is a swinging bridge (which doesn’t really swing too much) that crosses the river. We both went across the bridge and did get a good view of the river and its banks. Of course, we did jiggle the bridge a little to get the swinging effect. After this little jaunt we then visited the Hanapepe Café which is on Hanapepe Road, the main street in this town. The Hanapepe Café is owned by a friend of mine who took classes at the Westlake Culinary Institute where I teach children’s, teens and parent/child classes. Since it was really too early for lunch and we did have a breakfast of sorts we just decided to order the Mango Pie and Coffee. The pie was packed solid with sliced mango and the crust was really tasty and flaky. The coffee was excellent as well. 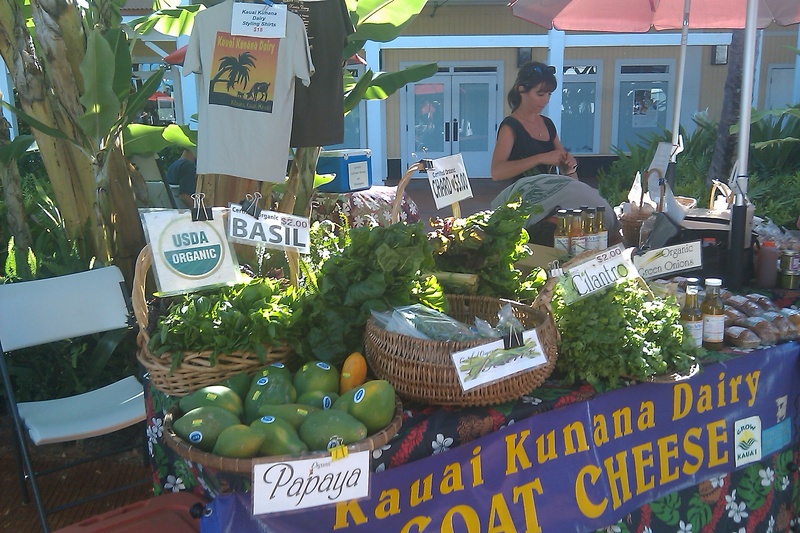 On the way back to our condo we stopped at the Living Foods Market in Kukui`ula Village near Poipu. While there we picked up some Eggs and Bacon for breakfast the next day and a Turkey Hoagie from their café. The sandwiches are made to order and there is a whole selection of items to put on them along with a large variety of meats from which to choose. There is also a variety of bread product to choose from. We ordered ours on a Hoagie Roll along with Lettuce, Tomato, Red Onion and Dijon mustard and mayonnaise. We brought the sandwich back to the condo as it was still too early to eat lunch. 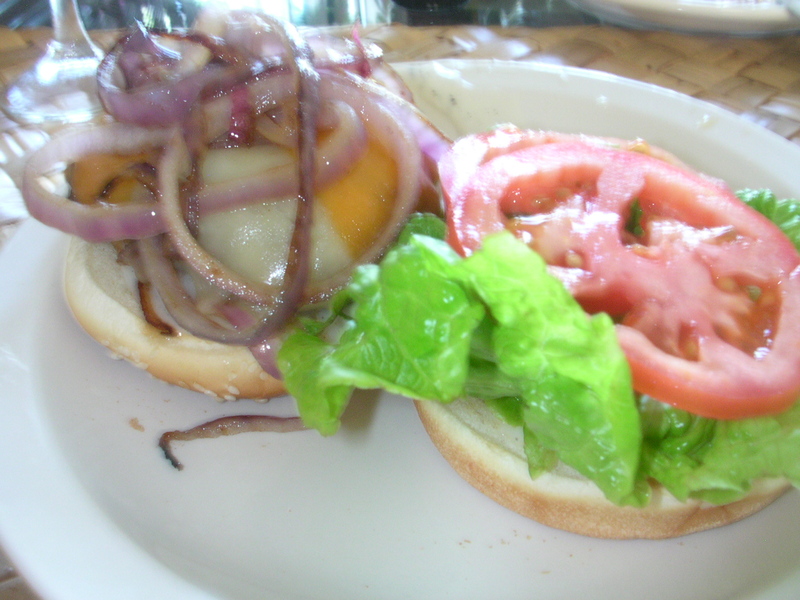 It was an excellent sandwich and we enjoyed it along with Maui Style Potato Chips. One thing about traveling around on Kauai is that Kauai is a small island and even when you are going from one town to another, it really doesn’t take very long to get anyplace, so that is why when we got back to Poipu it was still too early for lunch even though we had covered a lot of territory that morning. After lunch we went to the beach and enjoyed some sun, sand and surf. For dinner that night, we walked over to Kalapaki Joe’s which is advertised as a premier sports bar annexed to where we were staying. With a window seat you look out over the tennis courts and if you keep your viewing inside the restaurant, there are many TV Screens with sports events on them. We went during Happy Hour which extends from 3 – 6 PM. We each had two fish tacos at $3 apiece. Ev had a light beer and I had a Margarita which was a $5 special. The fish tacos were very good and were served with shaved cabbage on a cheese crusted tortilla and tomatillo cream sauce. The Happy Hour Tacos were a real bargain since two fish tacos during the dinner hour cost $9.99. Dessert was brownie bites back at the condo where we sat out on the balcony and enjoyed the sunset and the evening breeze. Be sure and check back in tomorrow for our next Culinary Experience. On Monday we woke up to the birds singing, the breeze wafting and the sun shining. This was the day that we decided that we would have breakfast out. We ended up at the Poipu Shopping Village and had breakfast at ‘Poipu Tropical Burger’, a restaurant that features much more than just Burgers on their menu. They opened early in the morning (6:30 AM) which was good since our bodies were still somewhere between California Time and Hawaiian Time. We both ordered the French Toast made with Portuguese Sweet Bread. It was egg battered and then dipped in cornflakes and served with diced Pineapple, butter and maple syrup. My preference for syrup would have been Pineapple or Coconut, but Maple is what was served and it was good. After breakfast we made a stop at Whaler’s which is similar to the ABC Stores which are all over Hawaii. They have almost everything from suntan lotion to breakfast, lunch and dinner items. You can buy beach towels and mats, drinks, chocolates, coffee and then some. After our perusal of Whaler’s we went back to our condo and lazed out on the balcony until it was time to go to the Farmer’s Market in Koloa. We were told that we should get to the Farmer’s half an hour before it opened because there are always a lot of people and the vendors sold out quickly. Since it was at the ball field in the town of Koloa, a couple of miles straight up the road from Poipu we decided to stop and check out Koloa first. Koloa is billed as the world’s largest small town. The business district is about three blocks long and has many types of shops including two full size markets, a deli, art galleries, ice cream stores and a real estate office. Since we had an early breakfast, we decided that we should eat lunch while waiting for the Farmer’s Market to open, so we opted for the deli. Ev had macaroni salad, an Hawaiian favorite and I had a Chicago Dog, another strange choice for Hawaii, but what the heck? 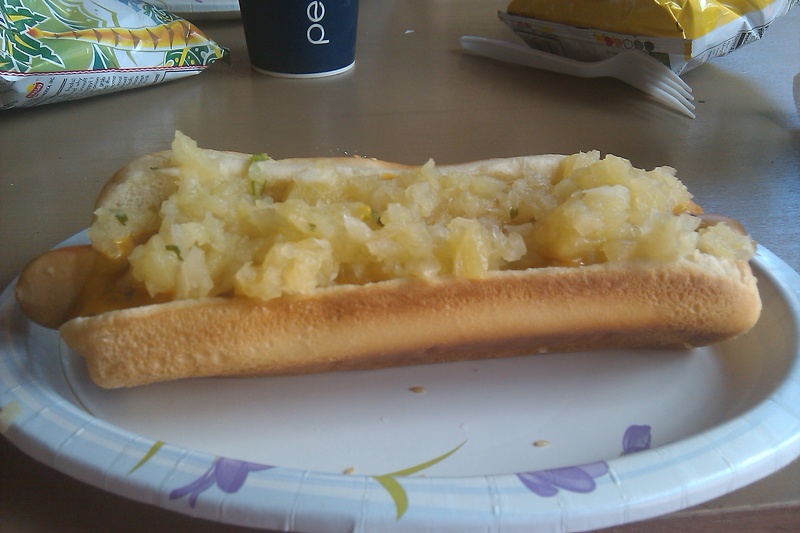 Chicago Dogs comes with tomatoes, usually peperoncini, mustard and onions. We still got to the Farmer’s Market half an hour before it opened and we weren’t allowed in until the official opening. It was well worth the wait as there were many vendors with fresh salad greens, tomatoes, tropical fruits and chilled coconuts with straws in them to drink the Coconut Water inside. In addition to the vegetables and fruit that I bought, I also purchased a couple of sprays of baby orchids which lasted for the whole ten days that we were in Hawaii. They added the right degree of atmosphere to our dining room table and meals that we enjoyed there. One thing that we didn’t know and will be helpful to those traveling and wishing to shop at the Farmers Markets is that plastic market bags have been banned and people have to bring their own bags to the Farmers Market. That made it pretty difficult, because I didn’t know this until I had gone in, so had to rely on what I could carry. Fortunately, some of the produce was already bagged and I just stuffed what I bought that wasn’t bagged into the bagged items. So, if you go to the Farmers Market when you are there, do bring tote bags with you. Even at the regular markets which give paper bags, you may have to pay for the bag, so if you can bring your own that would be good. After making our purchases at the Farmer’s Market we headed back into the business district of Koloa and went to the Big Save which is the largest market in that area. The meat department had many varieties of poki which is usually spicy, marinated raw fish. In addition to that, they had freshly prepared sushi. We picked up a large package of Caterpillar Rolls and some Papaya Seed Dressing along with Banana Bread for breakfast and chocolate brownie bites for dessert and of course soft drinks. We headed back to the condo to put away our purchases and to enjoy some more of the Hawaiian atmosphere, the breeze and the sunshine. For dinner that night, we had the Caterpillar Roll, a salad made from butter lettuce purchased at the Farmer’s Market along with Avocado and Papaya. 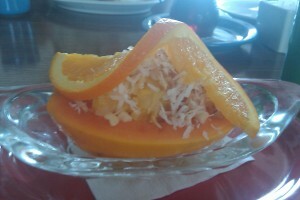 The salad was dressed with the Papaya Seed Dressing. Papaya Seed Dressing is a little on the sweet side, but it is something that we always enjoy when we are there and I always bring home a package of the dried dressing that we can reconstitute at home. It is on the order of Good Seasons, except that instead of adding vinegar and oil as in Good Seasons, you just have to add white vinegar and water. Therefore, it is a low calorie dressing packed with flavor. 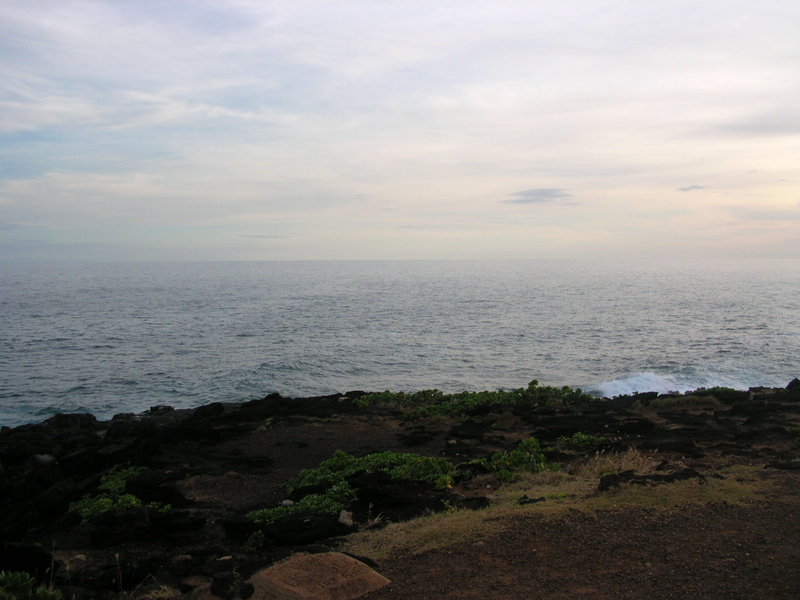 After dinner and about an hour before dusk, we headed down to Makahuena Point, (just a couple of blocks from where we were staying) to catch the sea birds coming in to roost. We ended the day by spotting the swiftly flying Hawaiian Petrol, a Wedgetail Shearwater and a Newell’s Shearwater. We constantly had to have our eyes on the flight path in order not to miss these birds as they suddenly appeared as out of nowhere and just as quickly disappeared. As we are avid birders it is always a thrill to be able to see these birds as they make their way in for the night. As the sun set we headed back to our car and to our condo for a relaxing evening listening to the surf and enjoying the gentle Hawaiian breeze. Tomorrow’s blog will include a description of our jaunt to Hanapepe to look for the rose-ringed parakeet and of course about the food that we ate. Don’t forget to check back! 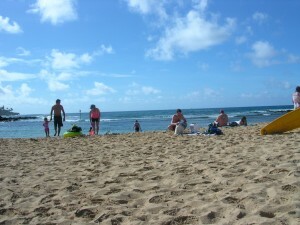 We just returned from 10 days on the Island of Kauai in our 50th State, Hawaii. While there we enjoyed the sunshine, the water and the food. 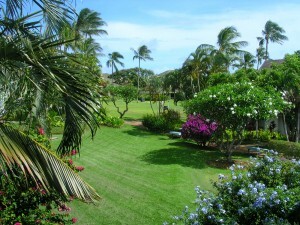 Our condo looked out over lush gardens that led to the ocean and Poipu Beach was just around the corner. I can still feel the gentle tropical breeze that softly bathed my skin and made me feel so relaxed. It was pure heaven! 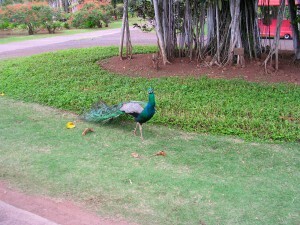 In addition to the beaches, the breeze and of course the tropical birds that we love to seek out, there is the food. 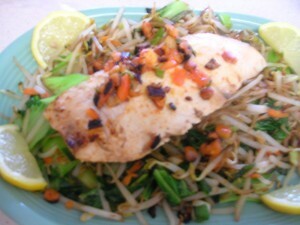 Fresh ocean fish, organic island grown vegetables and fruit that is sweet and juicy. 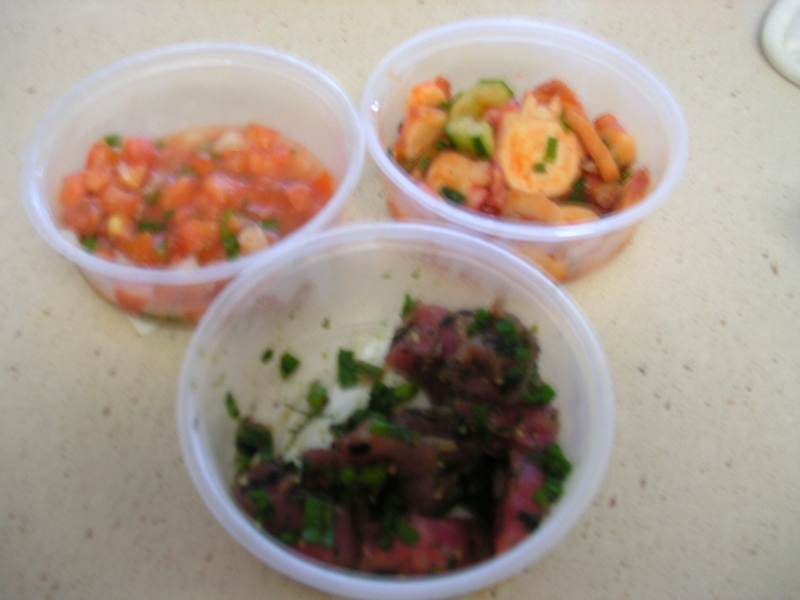 Since we had a condo with a full kitchen, we were able to prepare some of our meals from the produce and meats that we found at the Koloa Farmer’s Market, the local stores and roadside stands. In addition, we enjoyed many meals at the local restaurants. 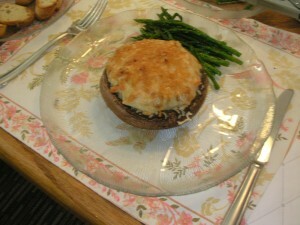 In the following paragraphs you will be able to read about some of the food that we ate and prepared. Our first day on the island was a Sunday and by the time we arrived at the Condo it was around 3:30 in the afternoon. We were greeted at the reception desk with a complimentary Mai Tai which was indeed nice to have after the flight and drive from the airport. Our condo was furnished with a fresh bag of Hawaiian Coffee and a complimentary bottle of wine (from California) with glasses chilling in the refrigerator. If you go to the Island of Hawaii do go to the Volcano Winery. Their wines are very good! After checking in and scoping out our living quarters we headed to the nearest market which was about a mile away. We bought the barest necessities that thought we would need as we had decided that we would have breakfast out on our first morning. For dinner we went to Merriman’s Downstairs Café in the Kuku’ula Village Mall. Appetizers (Pupus), Sandwiches and Salads are the featured item in this section of the restaurant. The upstairs restaurant features fresh fish and some meat items. Almost all the restaurants in Hawaii are open to the elements and this one was no exception. It is the one place in the world where you can enjoy indoor and outdoor eating at the same time. Of course, the birds are free to join you and since we love birds, we do not mind having them around. Ev had the Pasta Marinara (strange fare for your first day in Hawaii, but he does love pasta!). My choice was the Pineapple Buffalo Wings and Caesar Salad. I was hoping that since the BBQ Sauce was made with Pineapple that they would not be exceptionally hot, but they were indeed spicy and I ended up only being able to eat about half of them. The Caesar Salad was a good buffer as was the Mango Lemonade which was delicious. It is something that I am going to attempt to recreate at home here in California. Also in this mall was a restaurant called Josselin’s Tapas Bar & Grill whose menu really looked outstanding, but somehow we never quite made it there. Hopefully next time we will. A Market called the Living Market which featured organic produce and meats and fresh breads made daily. This market also had a café that served meals throughout the day. Their featured item was pizza and sandwiches made to order. And of course there was a Lappert’s Ice Cream Shop; Lappert’s is well known throughout the Islands and can be found in many places in Hawaii. 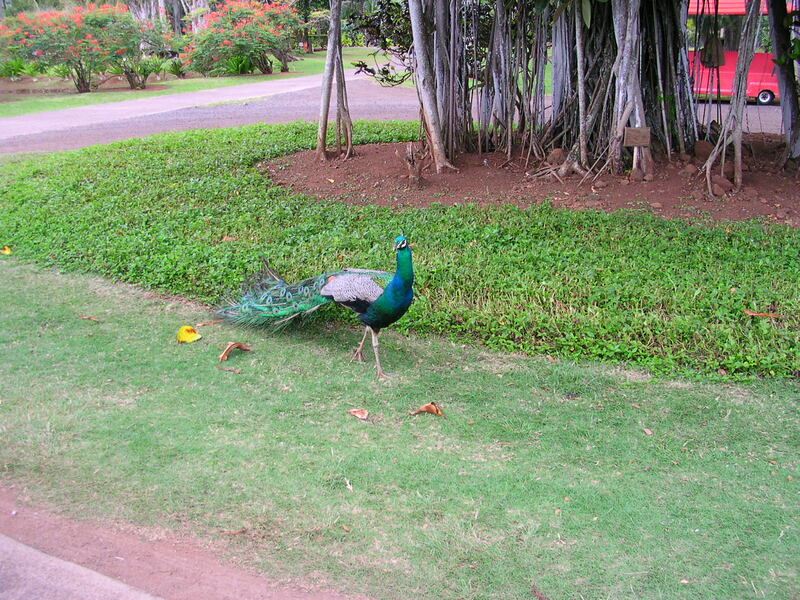 The ones that I am most familiar with is the one in Princeville and of course, the one right here in Poipu. My mouth was so heated up from the Chicken Wings that I simply had to have an Ice Cream Cone and enjoyed one with Mango in it. In Hawaii you have to eat your icecream very quickly so that it doesn’t melt all over you. It certainly was good though. 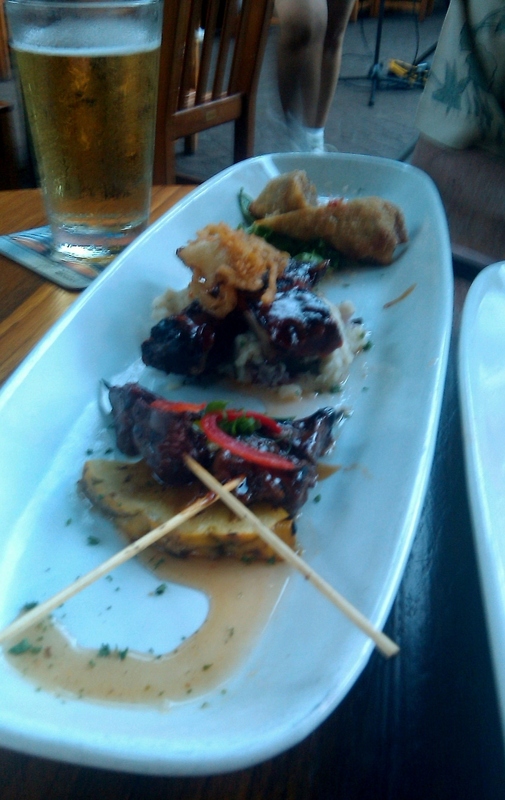 This was our first day in Hawaii and the first meal that we enjoyed there. Won’t count the airline food or the airport food as that doesn’t really count. Nothing to brag about, that is! Look for further daily articles on our Hawaiian Food Chronicles.